Both Nibyu and Begidu have experienced the life-changing salvation of Jesus Christ, which I believe has truly saved their lives. This Christmas, they are brothers, living life not in the abundance of things or creature comforts, but in the abundance of God’s love. By Randall Johnson, TFC Board Member When asked to share something that applied to this Christmas season, I could not think of any better story than that of Metu's. Her story encapsulates the beauty of Jesus' work in a desperate life through God's gift of salvation. Her real name is not Metu, but that is the name she has adopted because her own name is still too painful to use. I don’t know why, but when she lived on the street and experienced the abuse that comes from such a life, the use of her real name was something she felt compelled to give up and took on the name “Metu” instead. I made my visit to Addis Ababa in 2009 with my wife and one other Central Church member for our short term ministry trip. Our drive from the airport with Joe Bridges was a time for him to download about a little girl, Metu, who was coming to the drop-in center but who was causing disruption when there. Joe was concerned about her. When her grandmother, some years earlier, had come up completely empty in terms of providing for her grandchildren, she dropped Metu off on the streets of Addis Ababa. The belief, desperate hope we might rather term it, was that somehow God would take care of this child when the grandmother couldn’t. I remember feeling that I was going to meet Metu and that she was going to respond to the gospel. My prayer partner had told me before I left that he had experienced the strangest vision of a little girl coming to Christ as a result of my ministry there. I began praying for Metu. I did meet her and as we spent the next several days doing a modified vacation Bible school with the children at Onesimus I grew to love and enjoy this diminutive girl with the painful past. It was hard for her to trust that people loved her instead of just wanting to get something from her. Our team poured out the love of Jesus Christ in great huge buckets on all the children, including Metu. On our last day I presented the gospel and told the children that if any of them wanted to talk further about how to become a follower of Jesus Christ, to ask one of the Onesimus staff to meet with me. Not much later Metu brought our translator to me and he told me that Metu wanted to follow Jesus. I explained the gospel again and asked her if she was sure she wanted to commit her life to Christ, and she said she did. Oh, the joy! My heart has been knit to hers ever since. She continued to have struggles but became more and more trusting and obedient to her caregivers. She entered the halfway home and got off the streets. One day she will hopefully be united to a family who loves her. I fully believe that God is going to use her to reach others with the message of hope she has received. Yes, there is much growing to do. But her great pain is going to be her great ministry. I accepted Jesus when you were teaching about Ten Commandments and you asked what we were learning. I answered to you, “all people should accept Jesus.” Then you asked me, “are you willing to accept Jesus Christ as your personal savior?” I said yes, and you prayed for my life. That was the first day in my life that I made a decision to accept Jesus! Thank you for asking me about this and praying for me. Nega tells me about you. Makes a father’s heart proud! Ever since I can remember, part of my family’s Christmas tradition has been to make sugar cookies. These are not just any sugar cookies, but rather my mom’s special recipe cookies, topped off with decorations that make each one unique. Now that I’m a father, I love watching my children decorate their own cookies during our family Christmas get together. Typically, Jack displays his little piece of culinary art with great pride while McLaine gobbles hers and anyone else’s she gets her hands on within a split second (she’s a lot like her dad!). Want to do something meaningful with your family this year as you prepare for Christmas? 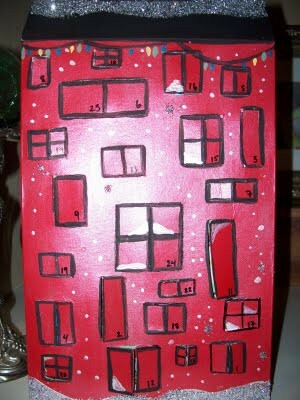 Join the Bridges and several other families in making a TFC Advent Calendar. 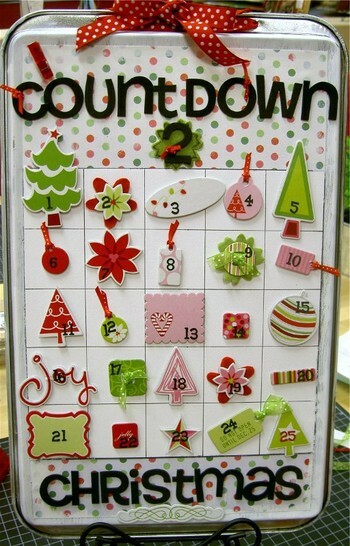 Assembly is easy and it is great way to prepare your heart and mind for celebrating the birth of Jesus. 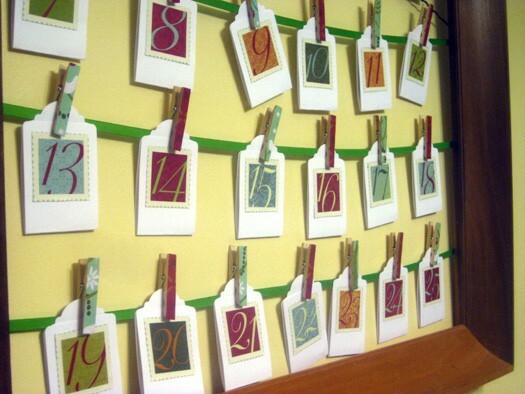 We have created cards with TFC prayer requests and a bible verse for each of the days leading up to Christmas and all you have to do is print them out, cut them out, and choose the type of Advent Calendar you want to create. The options are endless! 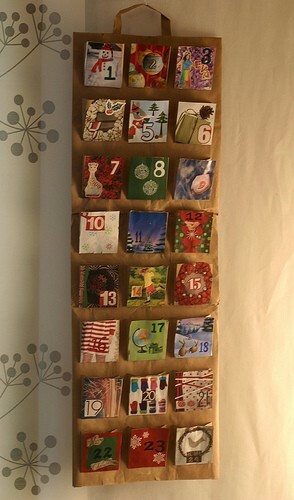 Once you choose the Advent Calendar you would like to make, print off the TFC Advent Calendar cards. Write a family activity on the back of each card that your family would enjoy doing (you could also write these activities on just a few cards if your family is very busy). Every family is different, so look at this list of activities and choose the ones that would work for you and create some of your own. If you come up with some new activities, be sure to share them with us below. 1. Make an ornament and give it to a neighbor. 2. Make stars out of empty cereal boxes, paint with glitter and hang from the ceiling. 3. Drive around and look at Christmas lights. 3. Make-up a family Christmas song to the tune of Jingle Bells. 5. String popcorn and hang it on your tree. 6. Visit someone in a nursing home and take them a Christmas treat. 7. Buy a new toy to give away to someone in need. 8. Clean out the old coats from your closets and donate them. 9. Volunteer at a local shelter to serve a meal. 10. Make cards for your pastor and other church leaders. 11. Send Christmas cards to the staff of Onesimus. 13. Watch a Christmas movie and order pizza. 14. Make a snow scape out of shaving cream and figurines. 15. Make a gingerbread house. 16. Write a Christmas story. 17. Make handmade gifts for teachers. 19. Go to a parade. 21. Play in the snow (if you have it). 22. Make a construction paper link chain. 23. Make a nativity scene out of recycled boxes and paper. From the folks at TFC!